This is the first of a long series of posts about the joys of driving in and around Washington, DC. Yes, that's right. 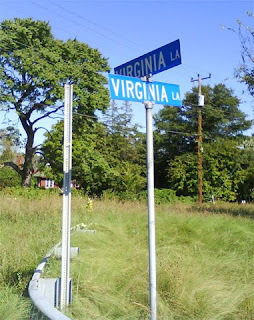 This is an actual sign marking the intersection of Virginia Lane and ... Virginia Lane. It is a four-way intersection, although there is no stop sign to really mark it. Kudos to the street planners who come up with creative names for different streets.